I didn’t get a photo of Willie, because I was too much of a chicken to do that too. So here’s one I found online. Thing #3: Say hello to Willie Simpson when you have the chance, you frigging chicken. So there I am at the Craft Beer Awards and look who’s standing over there. It’s Willie Simpson! Oh my God! It’s Willie bloody Simpson! Willie is now the guy behind Tasmania’s Seven Sheds Brewery. But that was before he had a leading hand in launching the great beer scene we have today. And he didn’t do it with a keg, but with a pen. Willie was the guy who managed to convince the Sydney Morning Herald it needed a beer writer. No small feat about 25 years ago when beer meant VB and Tooheys. Look! He’s right over there. You can almost reach out and touch him. Go and introduce yourself, dammit. This is the guy who spread the word of good beer when there wasn’t that much good beer to be had. He was the one that gave it a profile in one of the country’s leading newspapers, giving it a sort of legitimacy. Also, his writing would have been instrumental in inspiring plenty of today’s brewers to give it a crack. 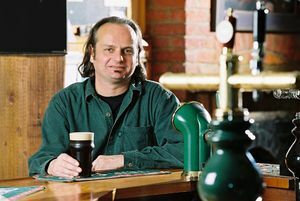 It’s quite probable that the beer scene today would be sadly lacking without him. Go over there and say Hi, you idiot. You’ve interviewed him several times over the years. You know he’s a nice guy to talk to. He’s also the guy who allowed me to write about beer for my local paper. Not directly, of course, but if he hadn’t blazed a beer reporting trail – and not just beer reviewing but beer reporting – there’s no way my editor would have said yes when I offered to write a weekly column. So he’s the reason I get free beer in the mail every now and then, why I get invites to places, why I can experience the great world of beer. What? he’s just won some lifetime achievement award? Great. Now he’s going on stage. Everyone will want to talk to him. Nice going clown, you missed your chance.